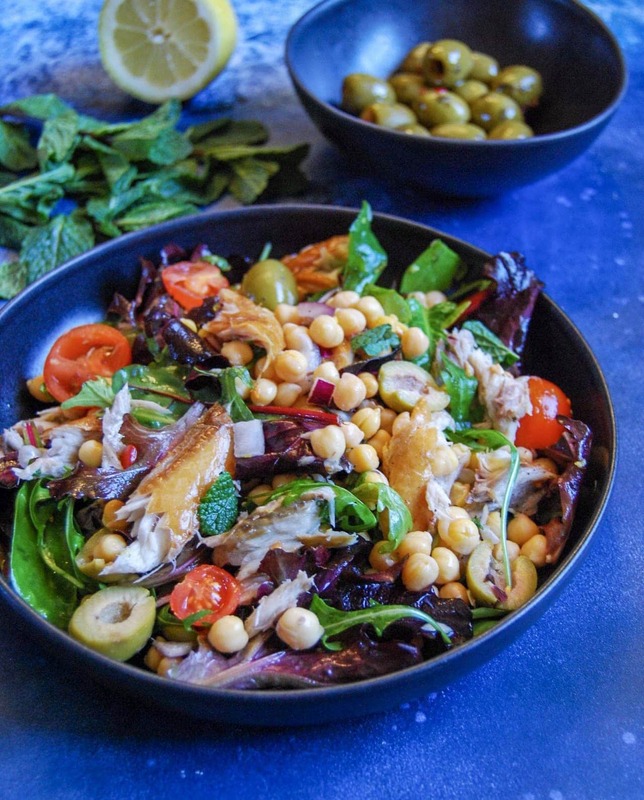 This smoked mackerel and chickpea salad is one of the easiest salads I’ve ever made – all you need is a packet of ready to eat smoked mackerel fillets, a tin of chickpeas, salad leaves, cherry tomatoes and olives and a simple lemony dressing to bring it all together! 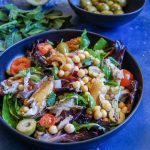 I’ve been trying to find different, quick to prepare and healthy lunch ideas and this salad ticks all the boxes for me – it’s very simple to put together and all the flavours go together very well. 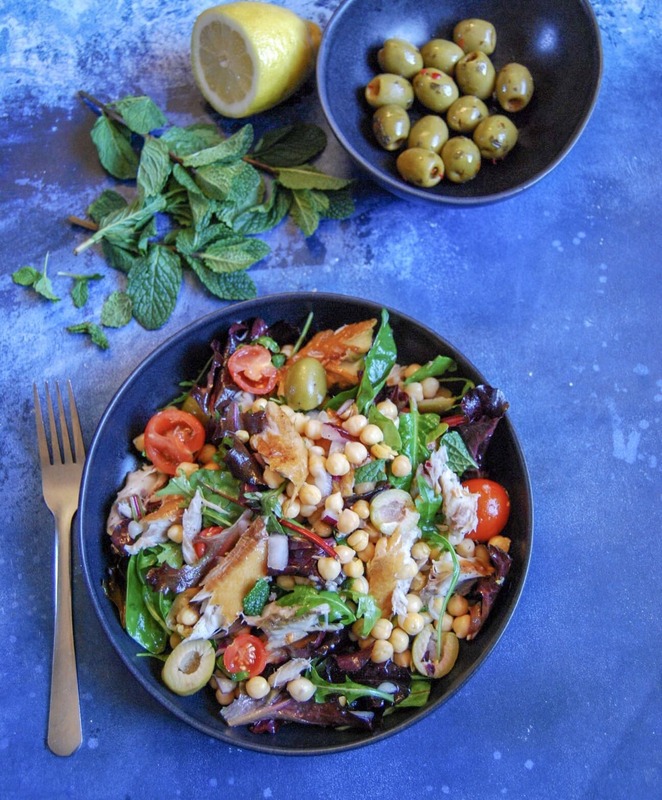 I love smoked mackerel – it’s so good for you and it’s ready to eat straight from the packet. It’s what I call real convenience food! 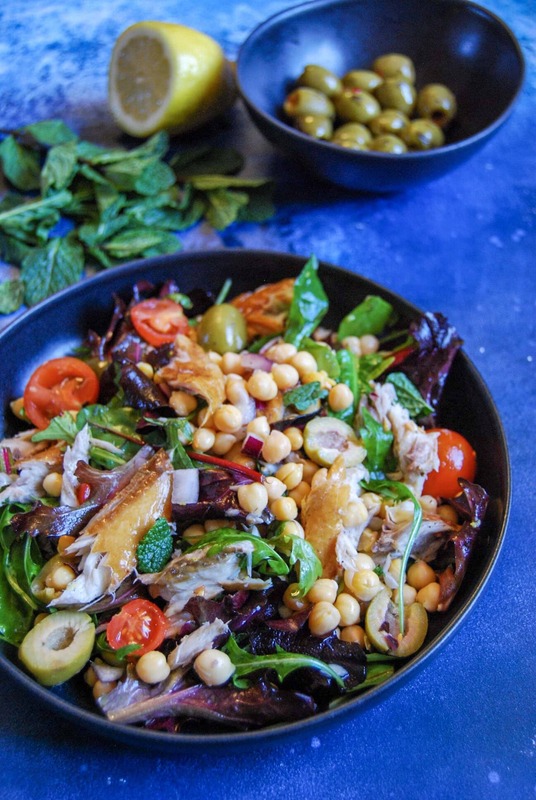 This salad is pretty versatile – you can swap one ingredient for another if you like. You could use chopped cucumber, radishes, or avocado to name a few. Use your favourite salad leaves – I like a mixture of rocket and baby leaves. 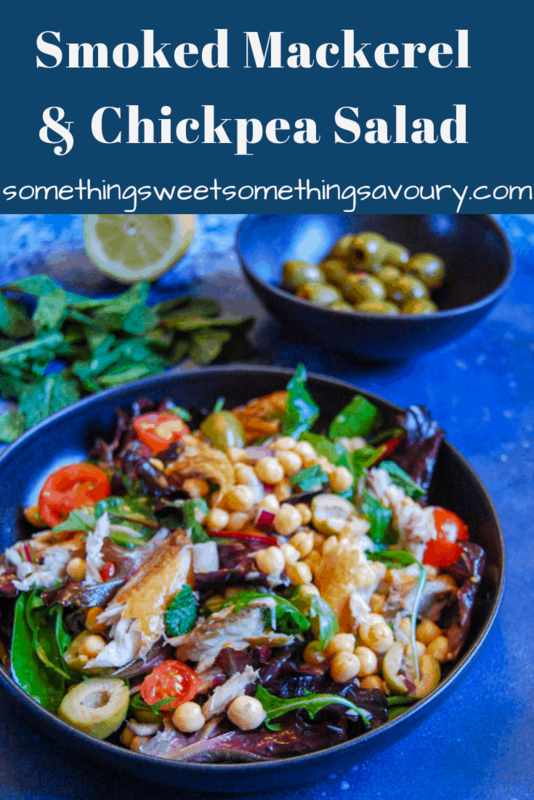 The chickpeas add great texture to the salad and provide a bit of “bite”. If you like you could use Cannellini beans instead. Drain and rinse the chickpeas and add the lemon zest. Empty the salad leaves into a bowl and add the chickpeas. Tear the mackerel into chunks and add to the bowl along with the onion, tomatoes , green olives and basil/mint leaves. Mix the oil and lemon in a small bowl and add a good grinding of sea salt and black pepper. Pour over the salad and using your hands, mix to coat everything in the dressing. This looks great! Easy to throw together and satisfying! Might make this for lunch tomorrow. Thanks Nicola – it was my lunch for two days running!